Fluence’s LED lighting technology has helped open a groundswell of research into the effects of the photosynthetic spectrum and how it can affect production for controlled environment agriculture. Now, with precise control over the lighting spectrum, scientists can go beyond the fundamentals of photobiology into a more nuanced understanding of plant responses to light quality. At the University of Florida, researchers are digging deeper to explore the photosynthetic spectrum as it relates to an often overlooked element of cultivation: water-use efficiency (WUE). By manipulating the ratios of red, blue, and green light, scientists are discovering how light affects WUE independently of other factors. 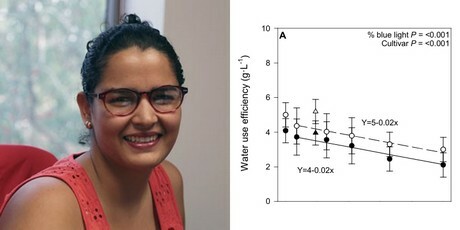 Gómez and her team have found a correlation between the percentage of blue light applied to lettuce and its water intake. Ultimately, they observed that blue light decreases WUE, most likely by increasing stomatal conductance, a plant function strongly tied to transpiration. The experiment’s treatments used six ratios of blue (446 nm) and red light (664 nm) which varied incrementally from 0% blue + 100% red to 100% blue + 0% red . An additional treatment incorporated broadband white light, which included green light. With every 10% increase in blue light, stomatal conductance of water vapor increased by 10 mmol·m-2·s-1. It is well known among horticulturalists and researchers that the typical morphogenic response to increased amounts of blue light is a reduction in plant height and leaf area. The reduction in radiation capture from more compact plants is believed to be the primary reason for reduced growth in response to higher blue light. In addition, stomatal conductance tends to increase with blue light. Gómez explains that this is triggered by cryptochrome and phototropin photoreceptors, which absorb blue light, and a resulting response in the ion channels of the plant which promote the aperture of the stomatal pore. In addition, blue light’s lower photosynthetic efficiency may have inhibited growth, thus influencing the WUE results. As Gómez notes, previous studies have found that blue light’s photosynthetic efficiency is up to 35% lower than other wavebands. A lower yield of plant mass affects water-use efficiency — regardless of water consumption. It’s also important to note that these experiments were performed in a controlled environment with specific environmental set points. Different set points may influence the responses measured on this study. To better understand the interactions of red and blue light, Gómez and her team also used a broad-spectrum lighting treatment. This white light group received the same daily light integral as the blue/red treatments (17.5 mol·m-2·d-1) but at a spectral ratio of 19% blue + 43% green + 38% red. The team found that plants grown under the broad spectrum light might experience better WUE than plants grown under >66% blue light from red and blue LEDs only. As a caveat, Gómez notes that this is a conceptual study rather than a real-world scenario; growers would not normally grow under such high percentages of blue light. Yet, the implications for future photobiological research are consequential. As spectrum research progresses, horticulturalists can expect more insights into previously uncorrelated production variables — like blue light and WUE. And with equipment support from Fluence Bioengineering, researchers like Dr. Gómez will continue to advance the science of lighting and cultivation.